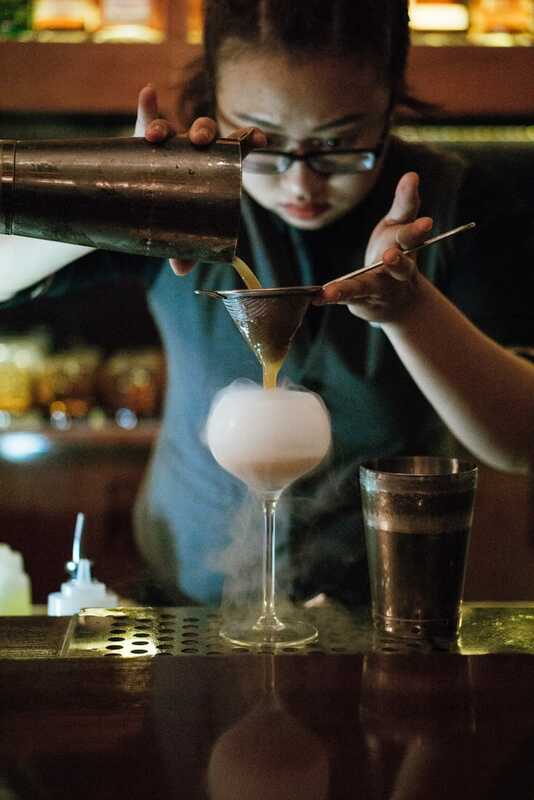 Firkin Bar won the Judge’s Choice Bar of 2018 Award for its attentive service and memorable cocktails. Despite its youthfulness, Firkin Bar has taken our Judge’s Choice Bar of 2018 Award ahead of a stellar pack of competitors. The bar impressed our twenty-person panel of foodies and industry insiders—and a couple of us from the Vietcetera editorial team—with its range of whiskeys, over 200 at the last count, and lots more unusual bottles of spirits like their Haitian Clarin ‘Casimir’ rum. The panel were full of praise for the “great atmosphere and attentive service,” and the “nice design and impeccable cocktails.” So, to celebrate their win, we dropped by for one of Grace’s signature cocktails, the Old Fashioned she makes with Dewars 18, and maraschino cherry and chocolate bitters. Can you describe Firkin to someone who’s never been? Sure. Let’s start with the name. So, a Firkin is a small aging barrel and we took that name because we are a bespoke cocktail lounge and bar that focuses on whisky. Our Firkin is also small with only 30 seats, but that gives us a sense of intimacy which allows us to dialogue with our guests. It also means we can explore their feelings and flavor preferences. We tailor drinks to how our guests feel and help those that are adventurous to discover new flavors and textures. We also hand-make many different bitters, infusions, shrubs, tinctures, cordials, syrups and edible garnishes. 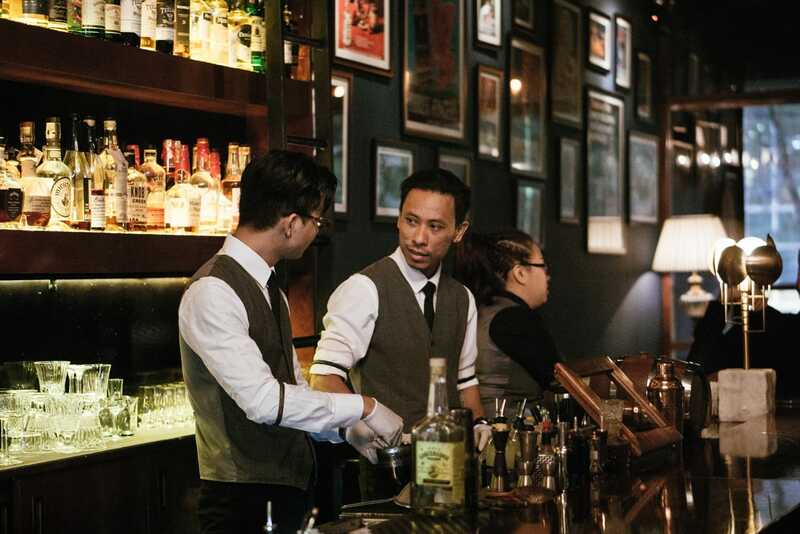 Firkin Bar took Vietcetera’s Grand Jury Bar of 2018 prize, an award launched to highlight bars that have made a mark on Saigon’s food and beverage industry. All the new drinks we create are written down and the recipes are remembered for next time. This also means the team are always learning every day. Added to that we also have over 200 whiskies from all over the world and we showcase whisky flights where we serve our guests blind so they can explore the smells and tastes—it’s a real journey. Which bottles are you most excited to take down from the shelves and serve? We enjoy introducing whisky flights from a single distillery with different age statements, ranging from anything between ten years old and forty years old. It’s fun to see, smell and taste how a single whisky evolves with ageing. Firkin hand-makes many of the components in their drinks, allowing for constant experimentation and learning. We welcome anyone of drinking age! But honestly, it’s always a mixed bag—business people, dating couples, friends catching up over a cocktail. That means what they order is pretty mixed too. 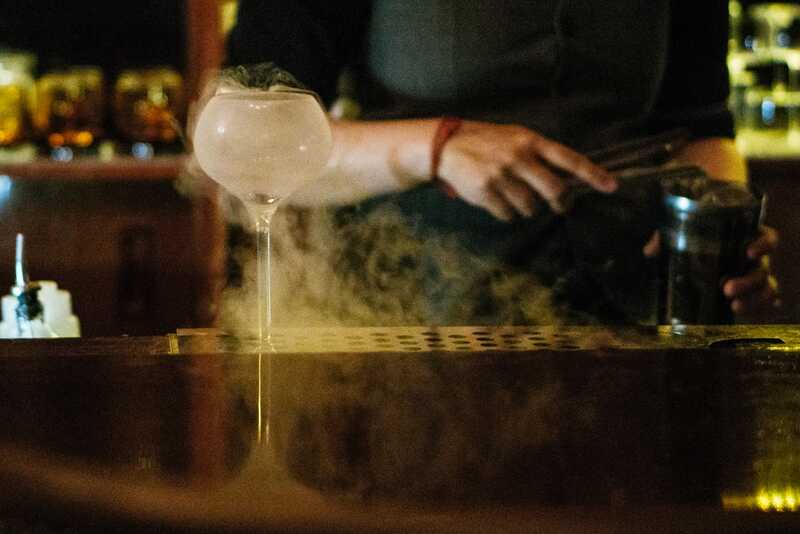 As we like to make drinks tailored to our guests tastes, we find out how they feel, and consider things like the time of day, what they like and dislike, and what ingredients are in season that we can employ. I remember someone once asked for a triple shot in their bespoke drink—it must have been a tough day. But our pours are already generous at 50-60ml shot in many of our bespoke drinks, so the triple-shot was a knockout cocktail! What have Firkin been doing in 2018 that other bars have not? To be honest, we don’t know what the other bars have been doing. 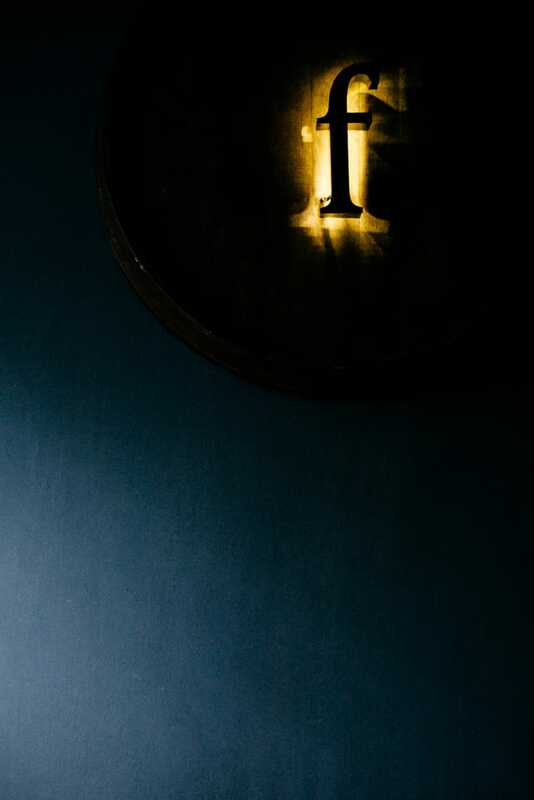 We just try to bring a personalized service to the guests and encourage them to explore their tastes. I know the speakeasy trend was big last year here, but we don’t see ourselves as a speakeasy bar and it was never our intention to be one. 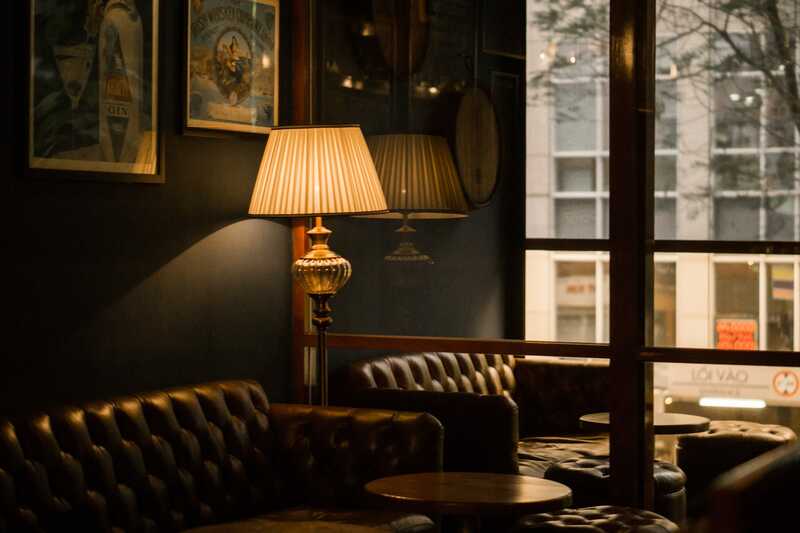 Firkin is a cozy and intimate bar where you can enjoy a conversation with very well made drinks. We like the menu with the cartoon caricatures of the bartenders and your suggestions of drinks to try. How did that come about and how accurate do you think the cartoons are? With so many choices and variations we wanted the menu to also be a guide. It should be easy to navigate for our customers. The suggestions change regularly as our team continually come up with new concoctions. And how accurate are the caricatures? It depends on how many drinks you have had! With a wide selection of whiskey and some serious personalized service, guests at Firkin are free to explore their tastes and preferences. This year a number of special guests dropped by Firkin Bar. Which one made the biggest impression on the team? Sam Ng from Four Pillars Gin Australia. I’m choosing Sam Ng because he was very open about sharing his passion with the team. He really helped us to understand Four Pillars Gin and how to create drinks that compliment the spirit. It was a great learning curve for the team. We’re coming to Firkin Bar. Where should we sit and what should we order? You sit at the bar and ask for me—Grace. Then let me and my team take you on a little Firkin bespoke cocktail journey….